Milani has not only charged forward in her study of computer science at UMBC, but she has also worked to make sure that, in the future, other girls who are fascinated by computer science can more easily connect with role models and peers who have a shared interest in the field. Campus Compact just awarded Milani the 2018 Newman Civic Fellowship in recognition of her work to increase underrepresented students’ access to opportunities in computer science. This selective national fellowship honors college students who are committed to their community and engage in direct action to create long-term social change, addressing issues of inequality or political polarization. It also recognizes recipients’ tremendous potential in public leadership. “Stephanie is a thoughtful, passionate, and supportive leader capable of inspiring others,” notes President Freeman Hrabowski, who participates in the nomination of the fellows. “Her passion to improve computer science education for marginalized populations is evident,” he shares. The Newman Civic Fellowship honors Frank Newman, the Campus Compact founder, and his commitment to educational access and responsible citizenship. Campus Compact is a national coalition of 1,000 colleges and universities, focused on teaching, research, and institutional action in service of the public good. The UMBC Shriver Center is a service-learning member of the Campus Compact Mid-Atlantic. Through this award, Milani will access in-person and virtual learning, networking events, and mentoring. She will also join a national network of peers who continue to work for social change after their fellowship year, providing support and resources to one another as they pursue public leadership positions nationwide. Milani is the fourth UMBC student to be recognized as a Newman Civic Fellow. In 2011 Kelly Cyr ‘12, biological sciences, and M.S. ’13, applied molecular biology, received the fellowship for her work to support animal welfare, developing a partnership between UMBC and the Baltimore Animal Care and Rescue Shelter (BARCS). She currently is a veterinarian at a Franky Fund hospital, providing care for homeless animals in need. In 2017 Sophia Lopresti ‘17, global studies, earned the fellowship for her work in global healthcare access as chairperson for the UMBC Global Brigades program in Central America. Max Poole leading March to College in spring of 2018. Image by Catalina Sofia Dansberger Duque. 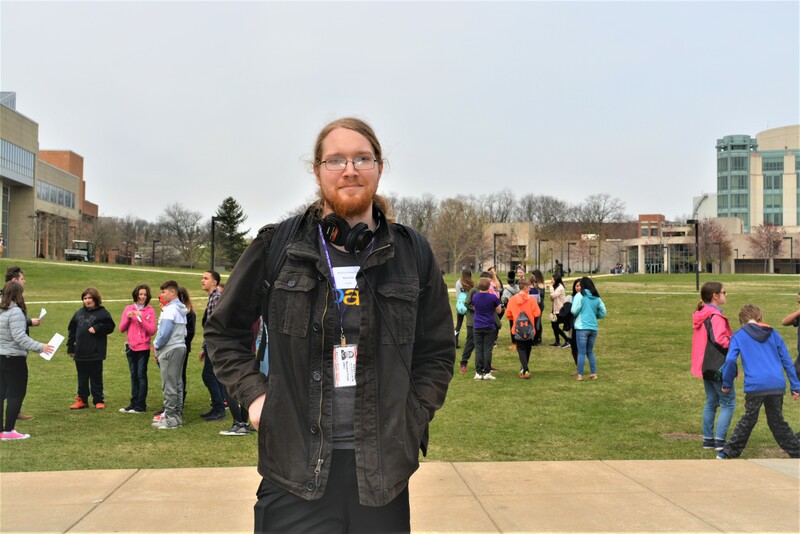 In 2016 Maxwell Poole ‘18, computer science, economics, and mathematics, received the fellowship for his service continuing the work of Nick Ramundo, a Maryland-DC Compact Americorps VISTA member at the Shriver Center who passed away unexpectedly, in the Arbutus Achievers and March to College programs. When, as a fellow, Poole attended a conference with the Newman program, he noticed none of the fellows at the time were focusing on expanding access to computer science for students from underrepresented groups. After returning to UMBC, he connected with Marie desJardins, associate dean of the College of Engineering and Information Technology and professor in computer science, and Stephanie Milani, who was interested in the access issue, to form Creative Coders. Their new program sought to introduce middle school students to computer science through game development. Poole nominated Milani for the 2018 Newman Civic Fellowship after seeing her dedication and commitment to expanding access to computer science. In addition to her work with Creative Coders, Milani is the president of UMBC’s Computer Science Education club, where she leads a diverse membership in hosting computer science outreach events on campus and in surrounding local middle and high schools. Milani has also developed curriculum for Computer Science Matters in Maryland and is a lead organizer for UMBC’s Hour of Code event, which brings Lakeland Elementary/Middle School students to campus for fun, hands-on activities with circuits and coding. Banner imager by Marlayna Demond ‘11 for UMBC.